An important additional proof of modern Israel's identity is found in a fantastic, detailed and most specific prophecy found in Micah 5:7-15. It is speaking specifically about the "remnant" of Israel — modern Israel today — wherever it is. It describes the wealth, the beneficent dominance among nations, and then the coming downfall of the American and British Commonwealth peoples in detail! Notice: "And the remnant of Jacob shall be in the midst of many people [nations] as a dew from the Lord, as the showers upon the grass, that tarrieth not for man, nor waiteth for the sons of men" (verse 7). Remember that dew and showers are absolutely necessary to agricultural productivity and are a symbol of national BLESSING and WEALTH from God. Again, this symbolism describes the last generation of Israel as a GREAT POWER — as a lion among the other nations of the earth. "Thine hand shall be lifted up upon thine adversaries, and all thine enemies shall be cut off" (verse 9). They WERE cut off from the beginning of God's birthright blessing on America and Britain starting about 1803, through the First World War, the Second World War, until the turning point of the Korean War at the end of 1950. Since that time, however, these blessings are surely being taken away — and neither America nor Britain has come out on top in any major skirmish since that time! 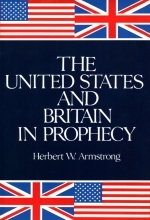 So this prophecy shows that at the very time we were receiving God's blessings, we were a tremendous BLESSING to the other nations of the earth — for it is our peoples who have rescued the other nations of the world time and again through the Marshall Plan, the Point Four program, the Alliance for Progress, the hundreds of millions of bushels of wheat for India and other starving nations, etc. The Hoover Program saved up vast food supplies after World War I. It saved millions in other nations from starvation! Anciently Joseph saved up the wheat and food and made it available to others. MODERN Joseph did also. BUT — we are stiff- necked and rebellious toward God and His law, while our ancient forefather Joseph served and obeyed God with a whole heart. It is our peoples who have been like a "lion" among the other nations of the earth — preserving in two great world wars the peace of the world and stability for all human life on this planet! Yet, in this detailed prophecy, God says: "And it shall come to pass IN THAT DAY, saith the Lord, that I will cut off thy horses" ["war-horses," Moffatt translation] — tanks, ships, rockets — "out of the midst of thee, and I will destroy thy chariots: and I will cut off the cities [by hydrogen bombs?] of thy land, and throw down all thy strong holds" (verses 10-11). How plain can you get? Here God identifies the GREAT peoples of the earth who are the most wealthy and beneficent, the most POWERFUL — yet at the very time their power reaches its zenith, He suddenly "breaks" the pride of their power (see Leviticus 26:19), cuts off their implements of war and destroys their cities! Why? Because, as the prophet continues to explain, we have too much "witchcraft" and too many "soothsayers" — false ministers — in our lands who refuse to preach with authority the commandments and ways of the living God! Therefore, God will punish and destroy us — unless we repent — just before and leading up to the utter destruction to come "upon the heathen" (verse 15), which will take place at the very END of this age and at the second return of Jesus Christ as King of kings! There is no other people that even remotely fulfills this great prophecy! But the American and British Commonwealth peoples fulfill it precisely! As the "pride of our power" continues to be BROKEN, as the British continue to lose their foreign sea gates and possessions around the earth, as America signs away ownership of the Panama Canal — control over this vital sea gate — as our gold supply drains away from this nation, weather upsets increase, this focal prophecy alone represents giant PROOF as to where the modern "remnant" of the peoples of Israel resides today! It will now be made plain — from God's own warning prophecies — that this greatest multiplied intensity of corrective punishment will fall on Britain and America — including British peoples in Commonwealth countries. And it will strike them down first! All mankind, right now, is caught in the vortex of the swiftly accelerating crisis marking utter destruction of this world's man- built, Satan-inspired civilization. Through Jeremiah God says: "A noise shall even come to the ends of the earth; for the Eternal hath a controversy with the nations, he will plead with all flesh" — how? Right now The World Tomorrow program carries His peaceful pleading worldwide, but the world, except for scattered individuals, does not heed this kind of "pleading." The next words tell HOW God is now about to plead: "... he will give them that are wicked to the sword, saith the Eternal .... Behold, EVIL shall go forth from nation to nation, and a great whirlwind shall be raised up from the coasts of the earth" (Jer. 25:31-32). God will use a Nazi-Fascist Europe to punish Britain-America. Then He will use the Communist hordes to wipe out the Roman Europe. We are entering a time of world trouble — utter world chaos! There is war, strife, violence in Asia, Africa, South America — as well as Europe and North America. The population explosion is a worldwide threat to human existence. Crime, violence, sickness, disease, inequality, poverty, filth, squalor, degeneration, suffering — these infest ALL nations! "For thus saith the Eternal; We have heard a voice of trembling, of fear, and not of peace. Ask ye now, and see whether a man doth travail with child? Wherefore do I see every man with his hands on his loins, as a woman in travail, and all faces are turned into paleness? Alas! for that day is great, so that none is like it: it is even the time of Jacob's TROUBLE" (Jer. 30:5-7). Remember — in passing on the birthright to the two sons of Joseph, Ephraim and Manasseh (Gen. 48:16), Jacob said, "Let MY NAME be named on them" — on Ephraim and Manasseh — who today are Britain and America. This tells ON WHOM this most terrible of national calamities is to fall — on Britain and America. But now when is it to fall? Do not assume this is referring to anything that did happen to ancient Israel. Read right on — see when this prophecy is to be fulfilled! So the time is just prior to Christ's COMING — coming to liberate our peoples — even as Moses liberated ancient Israel from Egyptian slavery. Other prophecies speak of this same time of national calamity greater than any before. The pivotal New Testament prophecy is that of Jesus on the Mount of Olives — recorded in Matthew 24, Mark 13, and Luke 21. The apostles had asked Jesus privately when His second coming would occur — and the END of this world and the beginning of the happy world tomorrow. Jesus said the SIGN by which we might know when this is very NEAR would be that His original gospel of the Kingdom of God would be preached in all the world as a witness to all nations (Matt. 24:14). But what else — just before His coming? Jesus continued: For then shall be GREAT TRIBULATION, such as was not since the beginning of the world to this time, no, nor ever shall be. And except those days should be shortened, there should no flesh be saved [alive]: but for the elect's sake those days shall be shortened" (Matt. 24:21-22). Here is described the greatest time of TROUBLE — TRIBULATION — in all history, or ever to be. Jeremiah described it as "Jacob's trouble," so great "that none is like it." The time is just before the RESURRECTION of the just, at Christ's coming. As Moses delivered the ancient Israelites from Egyptian slavery, so CHRIST is coming to deliver modern Britain and America from the now-impending Babylonish slavery. (See Deuteronomy 18:15; Acts 7:37; Jeremiah 23:5-8). Jeremiah described it as a "YOKE" on the necks of our peoples. WHOSE "YOKE" of slavery? Isaiah tells us! In verse 1 of Isaiah 47 the prophetic message is addressed to the daughter of Babylon. Not the Babylon of ancient days. Not Nebuchadnezzar's Babylon of 600 years before Christ — but a DAUGHTER of that Babylon, now, in our twentieth century. In prophecy a woman, or a daughter, means a CHURCH — a religious organization. This particular "lady" of this prophecy is pictured as a lewd harlot and "a lady of kingdoms." That is, a great CHURCH ruling over nations. This same modern "female" Babylon is pictured also in the 17th chapter of Revelation — there called a "great whore," sitting on or ruling over "many waters," which are interpreted in verse 15 as "peoples, and multitudes, and nations, and tongues." Her name is there given as "mystery, Babylon the great, the mother of harlots and abominations of the earth." In other words, the Babylonian mystery religion — the same religion of the ancient Babylon — but now grown GREAT and ruling over many nations of different languages. Her KINGDOMS over which she ruled were called "The Holy Roman Empire" of A.D. 554 to 1814, briefly revived by Mussolini and SOON to have a last and final "resurrection" by a political — military union of ten in Europe (Rev. 17:8-14). And the TIME this "great whore" sitting astride the political- military "beast," they shall fight in war against the glorified CHRIST at His second coming (Rev. 17:14). Now back to Isaiah 47. God says to this mistress of kingdoms: "I was wroth with my people [Israel — Britain-America], I have polluted mine inheritance, and given them into thine hand [in tortured slavery]: thou didst shew them no mercy; upon the ancient hast thou very heavily laid thy yoke" (verse 6). That YOKE of SLAVERY without mercy is to be laid on the U.S. and Britain by the coming united nations of Europe! It has started already, through the economic Common Market and the recently implemented EMS (European Monetary System). Its leaders talk continually of POLITICAL union — which means, also, military. So far they have been unable to bring about full political union. This will be made possible by the "good offices" of the Vatican, who alone can be the symbol of unity to which they can look. Two popes already have offered their "good offices" toward such union. Many of the ancient Assyrians migrated NORTHWEST from their ancient land south of the Caspian Sea — and settled in central Europe, just as the House of Israel migrated from the land of their captivity to the coastlands of northwest Europe. So when you read about Assyria in prophecies pertaining to now, they refer to central Europe. So, history is to repeat! It was ancient Assyria which invaded the House of Israel, and carried them out of Samaria into the Assyrian's own land. And where, today, are the ancient BABYLONIANS — the Chaldeans? They migrated west and settled in ITALY. Their religion was the Assyrian-Babylonian MYSTERY religion. It is going to come as a breathtaking, awesome, shocking surprise when the world learns that one Simon, the sorcerer of Samaria in the time of the original apostles, leader of the BABYLONIAN MYSTERY religion having the title of PATER or PETER, meaning PAPA, actually appropriated the NAME of Christ and the Christian principle of GRACE, which he turned into LICENSE, doing away with GOD'S LAW (Jude 4) and started what is today called "Christianity." How astonished the world will be to discover that it is NOT, and never was, the outgrowth of the CHURCH OF GOD, founded by Jesus Christ and His apostles! This knowledge will soon burst on an incredulous world as a BOMBSHELL! People will be SHOCKED to learn how they have been DECEIVED! When Gods time comes, the "news-bomb" will be exploded! Now it becomes painfully clear! The Great Tribulation is this sevenfold intensity of corrective punishment which God is now soon going to lay on Britain-America! Notice a few brief excerpts from Ezekiel's description of it! "A third part of thee shall die with the pestilence, and with famine shall they be consumed in the midst of thee: and a third part shall fall by the sword round about thee; and I will scatter a third part [the remainder] into all the winds [slavery], and I will draw out a sword after them. Thus shall MINE ANGER be accomplished, and I will cause MY FURY [last PLAGUES] to rest upon them, and I will be comforted: and they shall know that I the Eternal have spoken it in my zeal, when I have accomplished my fury in them" (Ezek. 5:12-13). Further: "In all your dwellingplaces the CITIES shall be laid waste" (Ezek. 6:6). This could never have happened until the hydrogen bomb! Cities laid completely WASTE. ALL of them — "in all your dwellingplaces." Now let the prophet Joel add more. Joel's prophecy was for the far, far future — verses 1-3 of chapter 1. Then he shows a plague of different kinds of locusts, devouring the fruits and food crops — stripping off bark from fruit trees. "He hath laid my vine waste, and barked my fig tree: he hath made it clean bare, and cast it away; the branches thereof are made white" (Joel 1:7). Continue — now comes devastating DROUGHT: "The field is wasted, the land mourneth; for the corn is wasted: the new wine is dried up, the oil languisheth .... because the harvest of the field is perished .... all the trees of the field, are withered: because joy is withered away from the sons of men" (verses 10-12). This is to happen just prior to the terrible plagues of "the DAY OF THE LORD" (verses 14-15). Continue the prophecy: "The seed is rotten under their clods, the garners are laid desolate, the barns are broken down; for the corn is withered. How do the beasts groan! the herds of cattle are perplexed, because they have no pasture; yea, the flocks of sheep are made desolate. O Lord, to thee will I cry: for the fire [hot sun] hath devoured the pastures of the wilderness, and the flame hath burned all the trees of the field. The beasts of the field cry also unto thee: for the rivers of waters are dried up ..." (verses 17-20). Next — Military Invasion and Defeat! Next in time order, beginning chapter 2, the alarm of WAR: "Blow ye the trumpet in Zion [alarm of war], and sound an alarm in my holy mountain: let all the inhabitants of the land tremble: for the DAY OF THE LORD cometh, for it is nigh at hand" (verse 1). "Therefore also now, saith the Eternal, turn ye even to me with all your heart, and with fasting, and with weeping, and with mourning: And rend your heart, and not your garments, and turn unto the Eternal your God: for he is gracious and merciful, slow to anger, and of great kindness, and repenteth him of the evil" (verses 12-13). AT LAST! — Repentance in Tribulation! Once God does add these repeated SEVENFOLD-INTENSITY of corrective punishments on our peoples — when they have had their wealth, prosperity, their land — the birthright and everything they possessed and set their hearts on TAKEN AWAY FROM THEM — AT LAST they will be humbled and will cry out to God for mercy and deliverance! Right now God's WARNING MESSAGE of this terrifying greatest trouble is being THUNDERED over The World Tomorrow program into ALL PARTS OF THE WORLD — as a witness! Multiple millions are reading it in The Plain Truth! We know only too well that the people as a whole will not heed! We are grateful that God is laying it on the hearts of a few thousand every year to LISTEN (hearken — to use biblical Authorized Version language) and to take it seriously — to REPENT and come to God through Jesus Christ as Savior. Yes, a few thousand every year — thousands PRECIOUS beyond estimate! But NOT the people as a whole. Not now! We know full well that the real HARVEST of our labors in GOD'S WORK, preparing the way for Christ's coming, is NOT NOW! But when everything these peoples have has been taken from them — when they are slaves in foreign lands — when they are cruelly treated, beaten, unmercifully even martyred and put to death — THEN millions of those who remain alive WILL cry out to God — WILL repent — WILL turn to live God's WAY. That is when the REAL HARVEST FROM THIS PRESENT WORK OF GOD will be reaped. Millions, then, will remember they heard Christ's true message over The World Tomorrow — read it in The Plain Truth! Then they will say: "That was the true message sent by God after all!" Many will take it lightly now — just as Israelites of old took God's message to them through His prophets. But when these things really HAPPEN — when people realize NO ONE ELSE warned them — then they will KNOW just WHO are the real FALSE prophets today! Then they will KNOW which is God's truth! The pitiful, pitiful tragedy of it! This realization will come TOO LATE to save the many from this repeated sevenfold punishment! BUT, for millions, not too late for their salvation — for God's GIFT of ETERNAL LIFE! Notice the prophecies of this very thing! Return for a moment to Jeremiah's prophecy. The 30th chapter, from which I quoted, ends with these words: "... in the latter days ye shall consider it." The prophecy is for OUR TIME, now! "At the same time, saith the Eternal, will I be the God of all the families of Israel, and they shall be my people. Thus saith the Eternal, The people which were left of the sword [those still then alive] found grace in the wilderness; even Israel, when he went to find him rest" (marginal rendering). Or, as in the RSV, "... when Israel sought for rest, the Eternal appeared to him from afar." Or, as in the Moffatt translation: "... Those who survive the sword shall find grace in the dungeon." That is, in captivity and in slavery! Continue, "Again I will build thee, and thou shalt be built, O virgin of Israel: thou shalt again be adorned with thy tabrets, and shalt go forth in the dances of them that make merry .... They shall come with weeping, and with supplications will I lead them: I will cause them to walk by the rivers of waters in a straight way [God's law! ], wherein they shall not stumble: for I am a father to Israel, and Ephraim is my firstborn [birthright-holder]. Hear the word of the Eternal, O ye nations, and declare it in the isles afar off, and say, He that scattered Israel will gather him, and keep him, as a shepherd doth his flock" (Jer. 31:4, 9-10). Later Jeremiah was inspired to write: "In those days, and in that time, saith the Eternal, the children of Israel shall come, they and the children of Judah together, going and weeping: they shall go, and seek the Eternal their God. They shall ask the way to Zion with their faces thitherward, saying, Come, and let us join ourselves to the Eternal in a perpetual covenant [the NEW COVENANT] THAT SHALL NOT BE FORGOTTEN. MY PEOPLE HATH BEEN LOST SHEEP: their shepherds [professing Christian ministers] have caused them to go astray ..." (Jer. 50:4-6). Later in this chapter: "In those days, and in that time, saith the Eternal, the iniquity of Israel shall be sought for, and there shall be none; and the sins of Judah, and they shall not be found: for I will pardon them whom I reserve [leave as a remnant]" (verse 20). This whole matter of Israel's rebellion against RIGHT WAYS, of God's driving them out, divorcing them, withholding the bestowal of the birthright for 2520 years — and of Israel's final redemption after the three additional sevenfold more intense corrective punishments — is summarized by the prophet Hosea. But Hosea also becomes very concise, direct, and specific in detailing Britain-America's national ATTITUDE right now! To picture this whole course of infidelity, rejection, withholding of blessing, extreme correction, and final awakening of Israel, God directed the prophet to marry a whore — to picture what Israel was to God. She bore him a son. God instructed Hosea to name the son Jezreel, meaning "God will disperse." For God said, "... I will ... cause to cease the kingdom of the house of Israel .... I will break the bow of Israel in the valley of Jezreel" (Hos. 1:4-5). The kingdom — the government — did cease at the Assyrian captivity — 721- 718 B.C. Hosea's harlot wife conceived again, and bore a daughter. God instructed that she be named "Lo-ruhamah," meaning "no mercy" for, saith God, "... I will no more have mercy upon the house of Israel; but I will utterly take them away" (verse 6). Later this lewd wife had another son. "Call his name," saith God, "Lo-ammi [meaning "not my people"]: for ye are not my people, and I will not be your God" (verse 9). "Yet," continued the Eternal, "the number of the children of Israel shall be as the sand of the sea, which cannot be measured nor numbered; and it shall come to pass, that in the place where it was said unto them, Ye are not my people, there it shall be said unto them, Ye are the sons of the living God. Then shall the children of Judah [the Jews] and the children of Israel ["Lost Ten Tribes"] be gathered together, and appoint themselves one head, and they shall come up out of the land [spread out far beyond their land — Moffatt translation]: for great shall be the day of Jezreel" (Hosea 1:10- 11). There, in brief, is a picture of the whole course of God's dealing with Israel. Today, our people say they are not "Israel." That is, NOT God's people! They think that the Jews, and the Jews only, are Israel. But very soon, now, they are going to KNOW their identity. Thousands will learn it from this very book you are now reading. The MILLIONS will learn it at Christ's coming! In Hosea 2, God says, in regard to our now having possessed the unprecedented WEALTH of the birthright promise: "For she did not know that I gave her corn, and wine, and oil, and MULTIPLIED her silver and gold, which they prepared for Baal. Therefore will I return, and TAKE AWAY my corn in the time thereof, and my wine in the season thereof, and will recover my wool and my flax given to cover her nakedness [her SIN]" (verses 8-9). But finally, when the correction becomes INTENSE enough, our peoples will acknowledge their transgressions, WILL REPENT, WILL SEEK THEIR GOD! God's People — At Last! "And it shall be at that day, saith the Eternal, that thou shalt call me Ishi ["MY HUSBAND"]; and shalt call me no more Baali ["MY LORD"]" (verse 16). "And," concludes this second chapter, "I will have mercy upon her that had not obtained mercy; and I will say to them which were not my people, Thou art my people; and they shall say, Thou art MY GOD" (verse 23). Then begins God's MESSAGE TO OUR PEOPLES TODAY — especially to the British peoples! "Hear the word of the Eternal, ye children of Israel [you people of the British Commonwealth and the United States! ]: for the Eternal hath a controversy with the inhabitants of the land, because there is no truth, nor mercy, nor knowledge of God in the land. By swearing, and lying, and killing, and stealing, and committing adultery, they break out, and blood toucheth blood. Therefore shall the land [of America and Britain] mourn, and every one that dwelleth therein shall languish ..." (Hosea 4:1-3). To the modern ministers in the churches of Britain and America, God says: "My people are destroyed for lack of knowledge: because thou hast rejected knowledge, I will also reject thee, that thou shalt be no priest to me: seeing thou hast forgotten the law of thy God, I will also forget thy children. As they were increased, so they sinned against me: therefore will I change their glory into shame" (verses 6-7). Speaking of the coming manyfold INTENSITY of corrective PUNISHMENT, God says, "... in their affliction they will seek me early" (Hos. 5:15). Speaking of modern Britain God says: "Israel [Britain] indeed is STUBBORN as a restive heifer; how can the Eternal feed them now ... ?" (Hos. 4:16, Moffatt translation.) God "feeds" His people today with HIS WORD — HIS GOSPEL OF THE KINGDOM OF GOD — HIS WARNING of what is quickly to come! The British government would not allow any broadcasting facilities within its jurisdiction that might be used by God's servants to proclaim God's MESSAGE OF THIS HOUR to the British peoples! But God was determined to get His message to the British! So, the first week in 1953, God's message started getting into Britain from Europe — when "The World Tomorrow" program began going out on the superpowered voice of Radio Luxembourg! When Radio Luxembourg was no longer effective for this message, God raised up broadcasting stations on SHIPS, ANCHORED JUST OUTSIDE BRITAIN'S JURISDICTION. "The World Tomorrow" WAS THEN THUNDERED over all of Britain DAILY, from SEVEN of these ships. They were not illegal. They violated no law of man. They DID proclaim faithfully THE LAW OF GOD! But the British authorities falsely called them "pirate" ships. They were NOT pirates. They were not marauders. They did not invade the land and pillage or steal. They harmed no one! But most governments of MAN would like to CONTROL what their PEOPLE hear or do not hear! They want to CONTROL your thinking for you! The British government and the national Church of England would LEGALIZE the revolting perversion of homosexuality! They would CONDONE heinous SINS, but no door inside the U.K. is open to broadcasting God's MESSAGE! But God did get His message to Britain. God Said It! God Did It! God has said, "Surely the Lord Eternal will do nothing, but he revealeth his secret unto his servants the prophets" (Amos 3:7), and in the verse just before this, "Shall a trumpet be blown in the city, and the people not be afraid?" God has said, IN YOUR BIBLE, that He would get the warning to His people Ephraim-BRITAIN. He has foretold: "Ephraim shall be desolate in the day of rebuke [and Britain is rapidly headed toward that prophesied desolation now]: among the tribes of Israel have I made known that which shall surely be" (Hos. 5:9). Yes, God said long ago He would GET THE WARNING into the hearing of Britain. Even though He had to do it FROM OUTSIDE BRITISH JURISDICTION, God moved miraculously to get His message thundered to all Britain. And the British government has NO POWER whatsoever to prevent the manyfold INTENSITY of corrective PUNISHMENT a loving God is going to cause to strike! Some day, people will wake up to REALIZE this is the Work of God! Of British churchianity, God says, "The Ephraimites are wedding to idolatry; LET THEM ALONE! — a drunken band, a lustful company, in love with shameful worship, not with my glory. When the whirlwind sweeps them off, they shall feel shame for their altars" (Hos. 4:17-19 — Moffatt translation). God says, "I withdraw to my own place, till they feel their iniquity and seek my face, searching for me in their distress, crying, "Let us return to the Eternal, for he has torn us, he will heal us, he has wounded, he will bind us up: in a day or two [Authorized Version — after two days] he will revive us, and on the third day he will raise us to live under his care ..." " (Hos. 5:15- 6:2, Moffatt translation). The coming Great Tribulation probably will last about 2 1/2 years — the "Day of the Lord" about one year — then comes the RESURRECTION and second coming of Christ! The entire book of Hosea carries a blistering message and warning to the BRITISH PEOPLE TODAY! God warns us through prophecy that our sins are fast increasing. And now the day of reckoning is here! The foreign sword always has attacked us. In this fearful, awesome atomic age, World War III will start with nuclear devastation unleashed on London, Birmingham, Manchester, Liverpool, New York, Washington, Philadelphia, Detroit, Chicago, Pittsburgh, without warning! God help our nations to wake up before it's too late! Yes, we are God's chosen people ISRAEL! Think what that means! Chosen, not for favors while we defy our God, but chosen for SERVICE we have failed to perform. We should shout for joy at the discovery of our true identity- -and we should be brought to REPENT — and to TURN TO GOD — and to get back of this crusade by radio and by printed word to WARN our people, and to call upon God in REAL heartrending prayer for divine deliverance. The sevenfold INTENSITY of punishment now soon to come upon the American and British peoples is simply the prophesied GREAT TRIBULATION! It will be the most frightfully intense PUNISHMENT, and time of TROUBLE, ever suffered by any people! This terrifyingly severe PUNISHMENT is simply the CORRECTION our peoples have made necessary to bring them to the ways of living which cause desired blessings, instead of terrible curses. It is CORRECTION — for the peoples' GOOD! As GOD LIVES, this punishment is soon to strike! This book has given the WARNING from God and His Word! Will the U.S. and British nations HEED? They could yet avert this colossal national tragedy, IF they would! But if you — you now reading this, you as an individual — will be corrected, voluntarily, before God lets this indescribably horrendous chastening strike; if YOU come to real REPENTANCE, realizing HOW TERRIBLY WRONG you have been; if you can see yourself as you really are — as a rebellious wrong, evil person; and if you can SURRENDER to the loving, all-merciful, yet all-POWERFUL GOD — and make it an UNCONDITIONAL surrender, coming to Almighty God through the living Jesus Christ as personal Savior — then NO PLAGUE shall come near you! (Ps. 91:8-11), but you shall be accounted worthy to escape all these frightful things and to STAND before Christ at His return (Luke 21:35-36). Those in the true Body of Christ shall be taken to a place of SAFETY, until this Tribulation be over (Rev. 3:10-11, applying to those faithful in GOD'S WORK now going to the world; Rev. 12:14; Isa. 26:20). But you must make your own decision — and to NEGLECT doing so is to have made the WRONG decision! Most people, we know only too well, will take this SERIOUS WARNING lightly — put it out of mind — turn to other immediate interests of no importance by comparison! That is why a loving, just, all-wise, all-POWERFUL God is going to take away from them these unimportant counter-interests, and apply such intensified CORRECTION that they shall, finally, come to their senses, and turn to Him and His WAY which will bring them eternal happiness and abundant blessings! By God's direction and authority, I have laid the truth before you! To neglect it will be tragic beyond imagination! To heed it will bring blessings, happiness and glory beyond description!